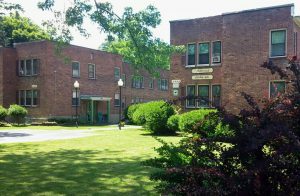 Hillcrest Garden Apartments are bright, two-bedroom, garden style apartments located in Niskayuna, NY. Situated within a quiet residential neighborhood with tree-lined streets, in an excellent school district, near G.E., Ellis and Saint Clare’s Hospitals and only twenty minutes from downtown Albany. Hillcrest Garden Apartments were built with enjoyment of nature in mind. They have windows in the front and back which allow cool breezes, sunny rooms and nice views of the well-kept garden. Also, an expansive city park is adjacent. There are no cars just beneath the windows because the off-street parking and garages are on either end of the two buildings. The larger, end apartments have windows on three sides and they also have a dining room. Most apartments have hardwood floors. The smaller bedrooms can be used as a den or study as can the dining room. Each bath has a tub with a shower. There are five closets in each apartment. There is a bright laundry facility in each building. 24-hour emergency maintenance.